The true Chicago style of pizza has an incredibly thin crust that is rolled out, not tossed like a New York pizza. This makes for a crust that is almost like a cracker, and pizza that isn’t meant to be folded. Chicago tavern-style pizza is also cut into squares, not triangular pie slices, which apparently seems insane to outsiders but perfectly normal to us. However you like it, deep dish or tavern-style, here’s our list of the 10 best pizza places in Chicago. Pizzeria Uno is the originator, the creator, the OG of Chicago deep dish pizza. Opened by an entrepreneur named Ike Sewell in 1943, the actual recipe was created by one Rudy Malnati Sr. It now has franchises around the country, but the original River North location still stands, serving up those famous pizzas to Chicagoans (mostly when they have out of town friends visiting). The second location, Pizzeria Due is right down the street serving up the same pies. 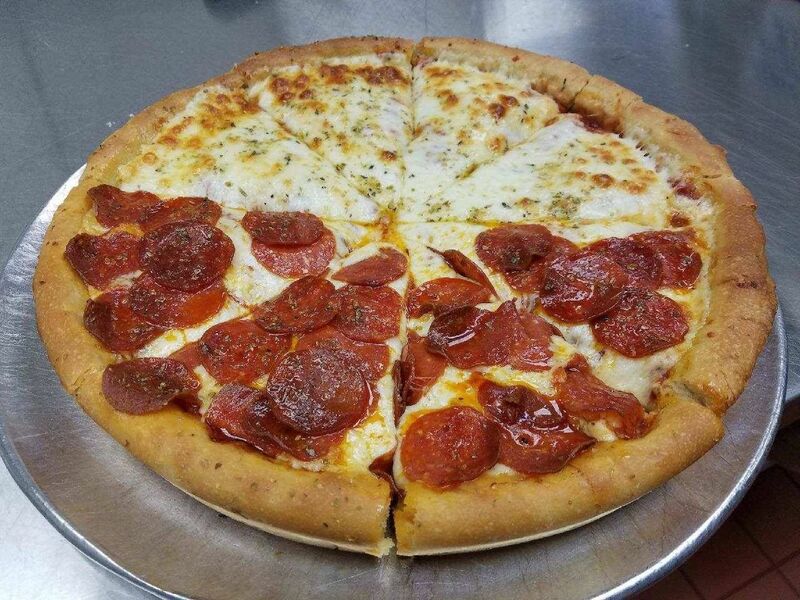 Just down the road from the Chicago White Sox’s South Side stadium, Phil’s Pizza is recognized as doing some of the best thin crust in the city. The thin, crispy crust has a great snap to it but is still enough to support a serious load of cheese and toppings. Order it topped with its homemade sausage and you’ll be rewarded with a perfect pizza covered in huge chunks of cheesy, meaty goodness. Pizano’s is another spot founded by a member of the first family of deep dish. Rudy Malnati Jr., son of the inventor of this Chicago classic opened his River North pizzeria in 1991. Pizano’s does a similar buttercrust to Rudy Jr.’s brother Lou’s famous pizzas, but he cooks the edges hotter to get some caramelization in the crust. Some people swear by it, others prefer Lou’s. In 1970, Lou Malnati took his decades of experience at Pizzeria Uno working with his father and opened Lou Malnati’s Pizzeria in the suburb of Lincolnwood. 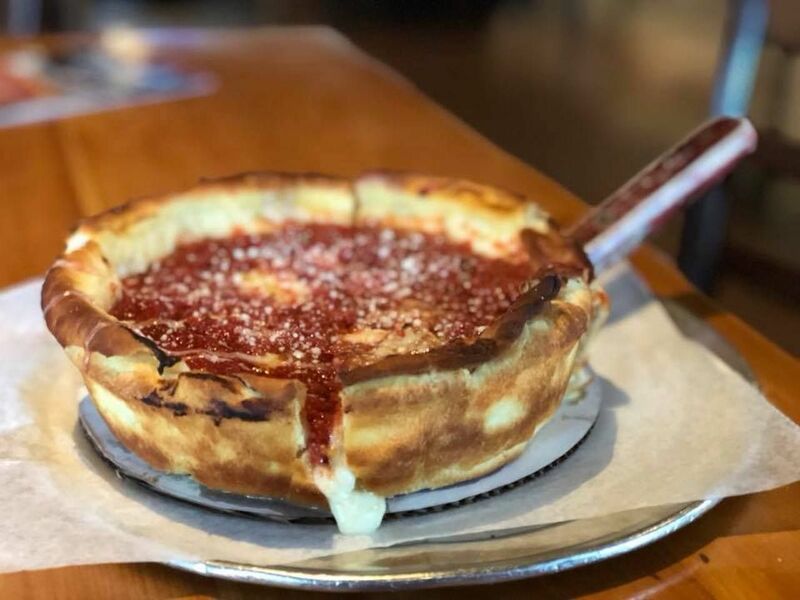 The deep dish pizzas were a hit from the start, and today the company has 54 locations around the city and suburbs, and is a favorite of many Chicagoans due to the signature garlic buttercrust. A South Side favorite for Chicago thin crust, Vito & Nick’s uses an old Sicilian family recipe to make a near-perfect sausage pizza. Staying true to old tradition, Vito & Nick’s prides itself on not delivering. If you want the good stuff, you have to go in for it. Nancy’s Pizza has a truly Chicago story. It begins back in the ‘70s with a recent Italian immigrant trying to innovate around deep dish by adding a second thin layer of crust above the cheese but below the toppings and tomato sauce. It moves on to a huge rivalry between competing families, complete with some major arson and criminal prosecution. 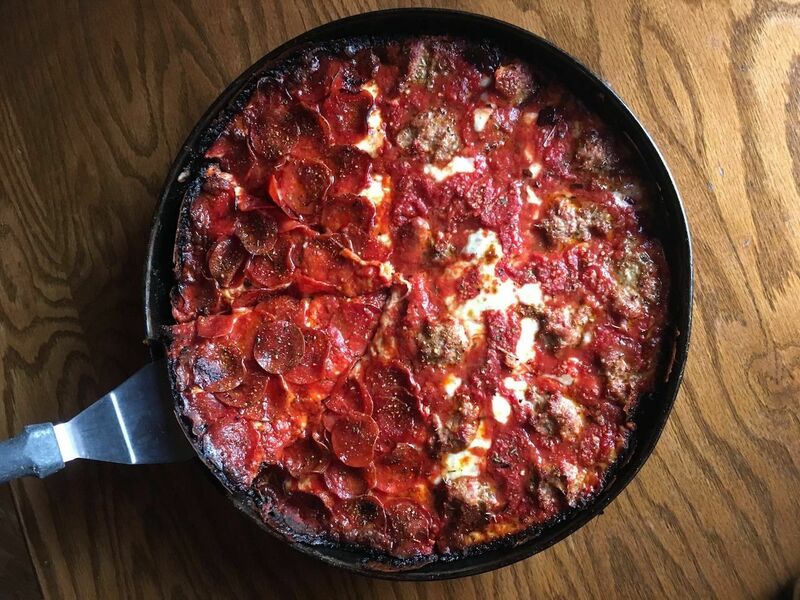 Today it has moved beyond that, and Nancy’s has dozens of locations, and stuffed pizza is a widely accepted and imitated variation on deep dish that can be found all over the city. The name might sound like a place that does kid’s birthday parties, but don’t be fooled. Pizza Castle, over 45 years old, is a South Side institution for thin crust pizza. It’s about as simple and no-frills as it gets, from the strip mall location to the counter service business model, but the pizzas and homemade fennel sausage are staggeringly good. A longtime favorite on the North Side, Art of Pizza does some of the city’s best deep dish from a single location in Lakeview. Its thin crust is damn good as well, and no matter what style you order you’re sure to get a generous helping of cheese and toppings. You can’t go wrong ordering a thin or deep dish Art’s Special — sausage, onion, mushroom, and green pepper, with just the right amount of cheese and red sauce to balance it all out. Way down in south suburban Evergreen Park, Rosangela’s Pizzeria does some of Chicago’s best thin crust. Like any good Chicago tavern-style pizza, the ultra-thin crust is crispy and light, but strong enough to support a big load of cheese and toppings, preferably sausage. 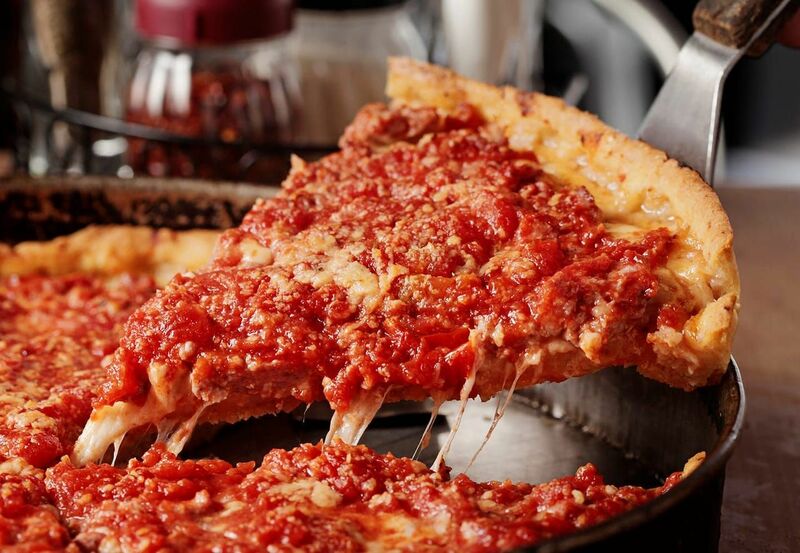 Burt Katz, a Chicago pizza legend, opened the original Pequod’s Pizza in Morton Grove in 1970. The innovation he brought to deep dish was the caramelized (but not burnt) crust. Although Pequod’s, and the equally good Burt’s Place are no longer owned by Burt, they still do that perfect crust today. 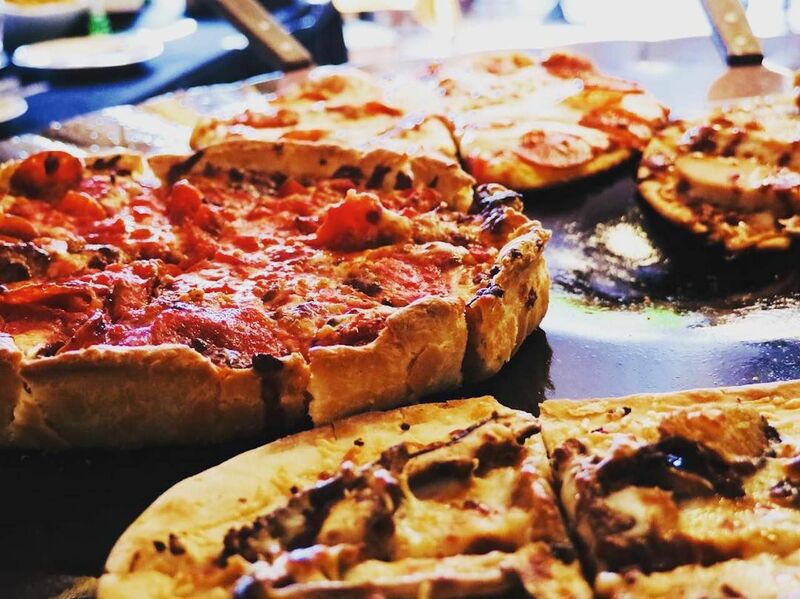 Pequod’s has a location in the city as well, so you don’t have to trek out to the ‘burbs.